Call it a box or call it a trunk, but be sure to call it wonderful! This small little Hand Tooled Leather Box decorated with brass tacks is nothing short of very special. Nice, small size . . . only 6-1/3" long x 3-1/4" wide and 4" high. It is lined with fabric with a paper lining on the bottom. The condition is remarkable. Thought we often encounter leather covered boxes of a larger size, I believe this is the smallest I have seen. 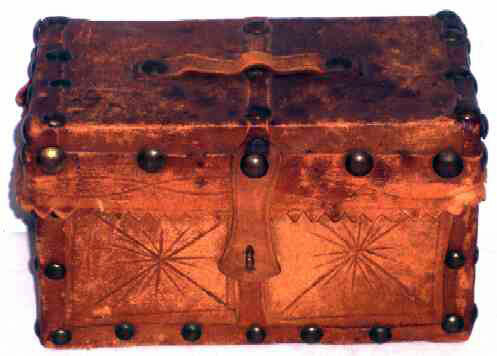 It was probably used to hold small items when traveling and then packed into a larger trunk. Obviously the years have been kind to it.